The Mazda RX-Vision Will Be Based Off Of Which Sports Car? Sounds like a recipe made in heaven. The automotive world went nuts when Mazda revealed its RX-Vision concept just last week. The return of the rotary engine in a beautifully sculpted body is big news in a time of environmental awareness and preservation. Now, the Japanese automaker reports that the RX-Vision concept will have its underpinnings based on a revised version of the Mazda MX-5 chassis when it goes into production. The only condition is if the engine is able to produce enough power to become a worthy successor of the RX-7 and RX-8. Fifty Mazda engineers are working on the rotary engine, trying to squeeze as much power from it as possible to bring smiles to rotary-engine enthusiasts. 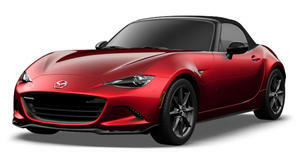 Mazda CEO Masamichi Kogai says that the the MX-5 chassis is “close to perfection” for a sports car because of its front-engined, rear-wheel-drive set up. We hope that the Mazda engineers can make enough power from the engine to please themselves and enthusiasts.